I was hoping to start this blog, written on the original date for Brexit, noting that, in contrast to most other UK citizens, I had begun the day outside the EU but had, during the course of the morning, re-joined the Union. The delay in the date for Brexit messes up that neat little opener but the experience of walking across the Green Line in Nicosia, from the Turkish Republic of Northern Cyprus to the Republic of Cyprus is a sobering reminder of the way that festering resentments within communities can spiral out of control. There are few certainties in UK politics at the moment but, based on voting patterns in the referendum, it is very likely that over 40 per cent of the population is going to be dissatisfied with the outcome of the Brexit negotiations. I have made my own views clear in this blog and I know that some of my readers disagree with my views. This post is not about the rights and wrongs of Brexit but about the aftermath, and how the country as a whole treats that large proportion who will almost certainly be disappointed by the outcome. The situation in Cyprus is complex but there are parallels to Brexit in that, after 1945, the key political question concerned a union (with Greece in this case) that would have left a significant minority of the population feeling disenfranchised. On the other hand, there is one key difference from the UK in 2019 in that the disenfranchised minority were ethnically distinct. In 1974 the failure to find a mutually-acceptable settlement led eventually to invasion by Turkish forces and the partition of the island which persists to this day. We in the UK should be thankful that there is no such clear “them” and “us” distinction as our politicians pick their way through the morass of possibilities. The draft withdrawal agreement, setting out how the UK leaves the European Union was published earlier this week, and has dominated domestic news coverage ever since. Theresa May’s government seems to have weathered the storm – just – but the likelihood of the agreement surviving a vote in the House of Commons seems small, meaning that political uncertainty is set to continue for some time. The agreement’s provisions for environment have received relatively little attention in the media during this period. This is surprising, given the importance of this topic generally, and the central role that European legislation plays in our domestic environment policy. As I have tried to offer a commentary on the Brexit process as it has unfolded (see “Environmental governance post Brexit” for the latest of these posts), I now need to steel myself for a scrutiny of the 585 page document (without even a contents page) to see what provisions have been made. The political brouhaha has focussed around the problems surrounding the land border between the Republic of Ireland and Northern Ireland, and the proposal that the UK and the EU remain as a single customs territory, run according to existing EU rules, for as long as it takes to achieve a satisfactory long-term solution. The prospect of being bound into EU legislation indefinitely is what has provoked the wrath of the hard Brexiteers; however, the rest of us need to bear in mind that the proposals set out in the withdrawal agreement are not indefinite. Once a long-term solution is agreed, then UK administrations will be free to modify legislation unless a future trade deal specifically incorporates provisions for the environment. The European Research Group’s argument that the UK will become a “rule taker” is disingenuous because the subsidiarity principle that was introduced as part of the Maastricht Agreement means that Member States always have had considerable liberty to implement EU legislation as they see fit. The EU legislation tends to outline the ambition and principles rather than prescribe how these are achieved. We already have strong domestic legislation that enforces environmental policy. I have not heard the Brexit camp offering credible alternatives to the ambition set by the EU that might suggest that the UK will be constrained in this respect. The key passages relevant to the environment are found in Annex 4, some 356 pages into the agreement. These commit the UK to “non-regression in the level of environmental protection” which means that environmental standards in force at the end of the transition agreement (including, importantly, “access to environmental information”) should not be diluted during the period that the UK is part of the single customs territory. The UK is also bound to adhere to the precautionary principle, the principle that preventative action should be taken, the principle that environmental damage should as a priority be rectified at source; and the “polluter pays” principle. We are also required to have “a transparent system for the effective domestic monitoring, reporting, oversight and enforcement of its [environmental] obligations … by an independent and adequately resourced body or bodies” (p. 359). This is, in effect, the new watchdog that Michael Gove has already proposed but with greater independence as it needs to have power “to conduct inquiries on its own initiative” and the right to “bring a legal action before a competent court or tribunal in the United Kingdom in an appropriate judicial procedure, with a view to seeking an adequate remedy.” Gove’s proposals put the new environmental watchdog under the control of DEFRA, which was widely regarded as compromising its independence. The question that remains is how much latitude a future UK government will have to deviate from the principles of EU environment legislation. The implication is that the UK and EU will move towards a long-term trade deal and my suspicion is that a level playing field for the environment will be a pre-condition from the EU for this to happen. This would mean that the principles set out in the withdrawal agreement would apply in the long-term (though the UK would not necessarily be bound to comply with any new EU environment legislation). What is also not clear is whether the UK would be expected to comply with collective decisions on implementation of existing Directives (and, indeed, to participate in reaching these) in the future. The Water Framework Directive, for example, is 18 years old, but there are still aspects of implementation that are being discussed. The EU will want the UK to stay in line with new developments; the UK should regard participation in the debates around these to be a quid pro quo. Almost every environment professional and academic I have met feels that leaving the EU to be a colossal mistake. However, if we accept that leaving the EU is now inevitable (I still need to be convinced that a second referendum would offer a more decisive outcome than the first), then I think the provisions for the environment set out in the withdrawal agreement are good. Even Michael Gove, an ardent Brexiteer, has acknowledged that the EU offers strong protection for the environment, and this agreement ensures that we go forward with as strong a foundation as we have at present. However, the prospect of this agreement passing the various hurdles in front of it are slim, so a more likely scenario at present is that the UK crashes out of the EU in March 2019 with no transition arrangement and no trade deal in place. That would leave UK environment legislation in a far more precarious position than is the case at present. “Learning from mum”: Heather’s prize-winning photograph in the 2018 BSBI photography competition shows her friend Priscilla botanising in Hannah’s Meadow, Upper Teesdale. 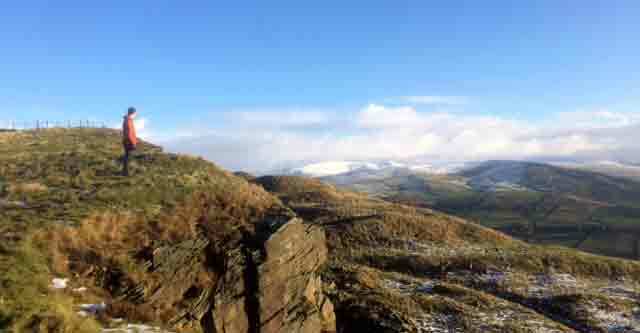 The photograph at the top of this post shows Upper Teesdale near Widdybank Farm, earlier this week. It is some time since I have written a post about Brexit but the time has come to re-visit one of the issues which I identified early on as a critical to UK environment policy once we have left the EU: the role of European institutions as powerful enforcers of policy (see “Who will watch the watchmen now?”). It was a concern reflected by the House of Commons Environmental Audit Committee and others (see “(In)competent authority”), leading to Michael Gove proposing a new environmental watchdog part to “hold the powerful to account” (see “Michael Gove has made a sensible suggestion”). The document in which these ideas are laid out in detail, Environmental Principles and Governance after EU Exit Consultation Document, has just appeared and it is worth taking a closer look. First point to notice is that this document applies only to England. Responsibility for the environment was devolved to Scotland, Wales and Northern Ireland in the 1990s; however, as the key environmental legislation has come from Europe, their activities have had a common focus until now. The UK administrations have worked together to ensure consistent application of the Water Framework Directive, in marked contrast to some other Member States (Belgium usually sends separate “Walloon” and “Flemish” representatives to meetings, for example). Take away the constraint of European law and the devolved administrations are free, in principle, to develop their own environmental legislation as they feel appropriate. There are moves towards a “common framework” for the environment but, as yet, no concrete mechanisms in place. In many ways, this consultation document encapsulates one of the biggest contradictions of the whole Brexit process: the slow, bureaucratic and barely democratic structures of the European Union are actually rather good at managing the environment and this is precisely because they override national sovereignty. A Member State has the right to implement EU legislation as it sees fit but the European Court of Justice acts as a powerful deterrent to any that might try to sidestep their responsibilities. Taking back control from Brussels and recognising the sovereignty of Parliament means, in effect, that DEFRA are responsible not just for developing and implementing legislation but also for scrutinising the effectiveness of that implementation. The risk, recognised by Michael Gove (though not in these words), is a self-affirming circle of smugness. So the consultation document makes two important suggestions: first, that a new policy statement is made in which the environmental principles that guide policy-making and legislation are set out, and second, a new independent watchdog is set up to ensure that governments adhere to these. The environmental principles might be set out in primary legislation or in a separate policy statement. The former would have more teeth whilst the latter would be more flexible, allowing the evolution of these principles as scientific and technical knowledge improve. The watchdog – “a new independent and statutory body holding government to account for the environment” – sounds like a good idea except, of course, that it is funded by, and must answer to the same government that it is holding to account. The Government, in turn, must balance “… environmental priorities with delivering economic growth and other policy priorities such as housing” (paragraph 83) and, as a result, this new regulator would be primarily advisory, and would lack enforcement mechanisms. It would not be an insignificant force but, at the same time, it would lack teeth. If economic growth, for example, depended on trade agreements with the USA and China, for example, will the government be prepared to sacrifice stringent domestic environmental targets? The irony is that one of the best indicators of the UK’s performance in any area of environmental policy is a comparison with that of other countries and the EU – via the European Environmental Agency – already provides a framework for doing this. If the rhetoric is that the UK will perform even better after we leave then EU then, it follows, the UK’s relative position in the many “league tables” that the EEA produces should improve*. A confident Michael Gove would, therefore, ensure that his new regulator worked as closely with the EEA as possible and, importantly, produced indicators that enabled such comparisons to be made. My concern, again, is that, restoring UK sovereignty in these areas will create greater headroom for political meddling and spin. Michael Gove’s appointment as Secretary of State for Environment, Food and Rural Affairs was greeted with caution by many working in the environment, given his mixed track record in his previous roles. We were, however, cautiously optimistic as, for the first months of his tenure, he made all the right noises. He is a politician who likes the big picture and is not afraid of a grand rethink of entrenched ideas. However, the environment is a sphere of policy where grand rhetoric is cheap and the devil lies in the detail. The consultation on environmental principles and accountability for the environment shows up the weakness of the UK’s muddled thinking on Brexit: the EU has many faults but handing back control of the environment to a parliament whose members are slaves to short-term cycles of public opinion is unlikely to deliver a greener future any time soon. * in practice, of course, the four administrations of the UK may need to report separately in the future. England might well drop a couple of places whist Scotland and Wales could improve, simply due to the differences in population density. The blog on the www.brexitenvironment.co.uk website is well worth a visit if you want to learn more about this topic. As is now traditional, I end the year with a word cloud based on the posts I’ve written over the past 12 months. 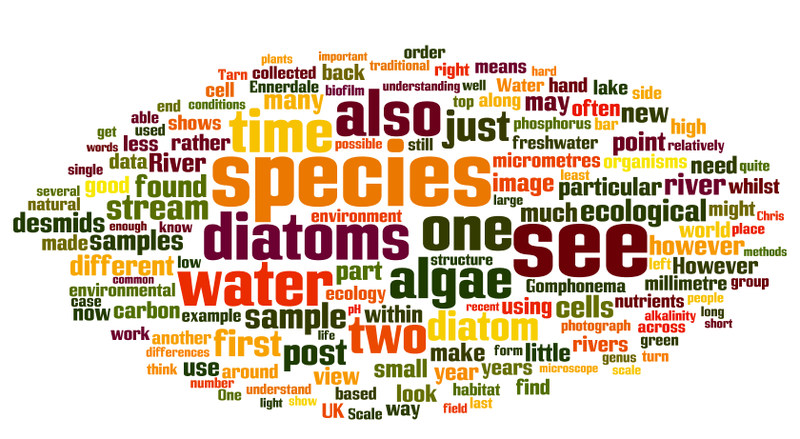 Comparing it to 2016’s word cloud I see that “see” is still prominent but that the word “diatoms” is now larger than “algae” whilst “desmid” also makes an appearance on the left-hand side. “Brexit”, despite occupying much of my thoughts, does not merit an appearance. I am no more optimistic as 2017 closes than I was at the end of 2016. The Government still has no clear vision for life outside the European Union and the impact on the economy is still uncertain (see note at the end). There are a few shafts of light: I was pleased to see, for example, that Michael Gove was prepared to consider a new environmental regulator wholly independent of government (“OfEnv”, as some have termed it), responding to genuine concerns raised by Caroline Lucas and others (see “(In)competent authority”). We will, however, have to wait to see how these fine words are translated into action, bearing in mind Michael Gove’s track record in other ministerial roles. An “OfEnv” will have its work cut out. I suspect that one of the unintended consequences of Brexit is going to be a yet greater squeeze on public finances. This is because many issues whose budgets were, to some extent, ring-fenced in order to meet UK’s obligations to the EU will be less protected in our post-EU economy. Bearing in mind the huge political significance of health care and education and, in the case of the former, the increasing care needs of an aging population, every other sphere of government spending is going to be under intense scrutiny. At best, the environment is a mid-table concern in the eyes of politicians, which makes Government funding crucially dependent upon the state of the economy. That’s ironic in the extreme because one of the most thought-provoking books I read this year was Doughnut Economics by Kate Raworth (Random House). Her core argument is that an economic system focussed on growth is unsustainable for many reasons, one of which is the likely consequences for the environment. Yet environmental regulation is, at present, dependent upon tax revenues arising from the tired economic system that Kate Raworth decries. And the hiccups in economic growth from 2010 onwards have put enormous strains on the Environment Agency and other environmental regulators, though management is reluctant to admit this publicly. I suspect that the BBC’s self-satire “W1A” is very close to the mark for much of the public sector. Its catchphrase “more of less”* catches the dilemma faced by middle-managers who have bought into an illusion that a leaner, more efficient organisation has arisen from the self-examination that cuts have precipitated. There are no easy answers. Long-term, I suspect that neither the EU nor a post-Brexit UK government will deliver a truly green future, for as long as both depend upon politicians needing to meet the material aspirations of their electorates. Wanting less is a good first step for each of us, as individuals, but such lines of thought are too far from the core business of this blog for me to venture. I’ll leave that with you as my personal New Year’s resolution and see you all in 2018. Raworth K. (2017). A doughnut for the Anthropocene: humanity’s compass in the 21st century. www.theLancet.com/plantary-health 1: e48-e49. I was pulled up by one reader for my pessimistic view of the economic prospects post-Brexit. I have, consequently, changed the wording to emphasise the uncertainty in all economic predictions. Three reports from responsible sources that offer perspectives on the post-Brxit economy are: Brexit and the economy one year on, Brexit: is the UK economy growing or slowing? and: UK economy in 2018: steady growth tempered by Brexit politics. My primary point – about the vulnerability of the budgets of environmental regulators – remains. 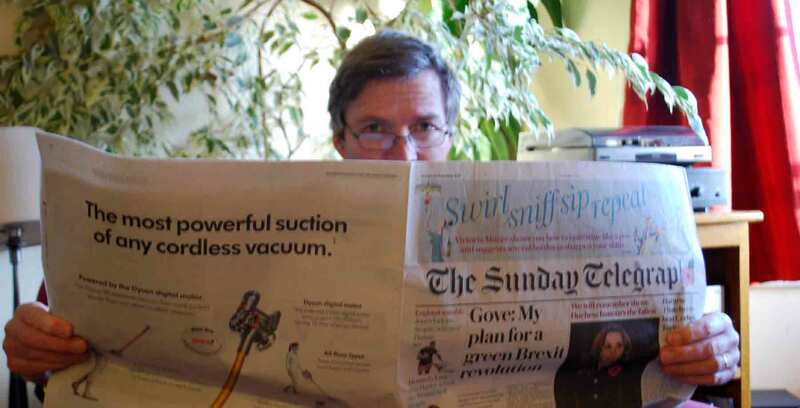 I found myself buying the Sunday Telegraph for the first time in my life a few days ago, as Michael Gove chose this newspaper to announce his plans for a new environmental regulator. His proposal links back to points I have made previously about a need for a new type of regulator to take over the role of the European Commission and European Court of Justice in holding the UK governments to account once we have left the EU (see “(In)competent authority” and “Who will watch the watchmen now?”). Gove is in a difficult position in his role of Secretary of State for the Environment, Food and Rural Affairs. His instincts, as a leading architect of the “leave” campaign, are against the European Union yet, for the environment at least, he cannot deny that there are many benefits that the EU has brought. He acknowledges this: “Some of the mechanisms which have developed during our time in the EU which helpfully scrutinise the achievement of environmental targets and standards by Government will no longer exist in the same way, and principles which guide policy will have less scope and coverage than they do now”. Too right. His proposal is for a “world-leading body to give the environment a voice and hold the powerful to account, independent of government and able to speak its mind freely”. That sounds promising, in the same way that Gordon Brown’s decision to make the Bank of England free of political control back in the late 1990s. Of course, such bodies are never completely independent (witness the way that John Redwood, Jacob Rees-Mogg and others turn on the Bank of England whenever it dares contradict the most optimistic post-Brexit forecasts) but it is a step in the right direction. So I will await, with interest, the consultation that Michael Gove promises in his Sunday Telegraph article. I am hoping that this means that the Environment Agency will still be the tool of official government policy whilst this new body will be independent and able to point out shortfalls in performance. I’m hoping, too, that this will bring some new thinking into environmental regulation, preserving the best of the EU systems whilst, at the same time, shaking up some of the aspects – such as the integration of environmental and agricultural policy – where the EU was notoriously weak. The elephant in the corner of the room is finance. The Environment Agency is currently working on a shoestring and, unless more money from Government is forthcoming, they and this new Agency will simply be unable to afford to be “world-leading”. Somehow the Environment Agency muddles along, thanks to well-motivated staff, but corners are being cut and monitoring the state of the environment – one of the cornerstones of any effort to giving the environment “a voice” – has been a major casualty. As I have written a lot over the past year about the positive effects of the EU on UK’s environment, I cannot let last week’s triggering of Article 50 – the formal start of the “Brexit” process – go without a mention. This time last year I was on the Great Wall of China, reflecting on borders and migration (see “Reflections from the Great Wall”). As Theresa May’s letter was delivered to Donald Tusk I was, by coincidence, reading another book about boundaries, Rory Stewart’s The Marches. In this book he describes his travels around the borderlands between Scotland and England, but which also draws upon his own travels and experiences in Iraq, Afghanistan and other parts of central Asia. A point that he makes more than once in his book is that borders are, in many cases, artificial boundaries which, over time, create the differences that distinguish two cultures. Scotland and England are, in his view, good examples: neither Hadrian’s Wall nor the present national border were placed with any regard for the identities of the people on either side. The only natural cultural boundary, in his view, was that between the highland and lowland Scots, roughly coincident with the Highland Boundary Fault. In the far past, lowland Scottish culture merged seamlessly into northern English culture as you travelled south until, in Medieval times, a more formal border was established. From that point on, individuals on either side of the border looked north or south respectively and, gradually, over time, distinct “Scottish” and “English” identities emerged. Those who inhabit the borderlands become, in turn, pawns that distant political powers used to strengthen their hold on the land and, in turn, destabilise those on the other side. Being an island, of course, accentuates differences between Britain and the rest of Europe but we only have to look at the differences within this island to recognise the artificiality of this British nationalism. And those stirring speeches that Shakespeare put into the mouth of Henry V? The real events behind those plays was part of a military campaign by the English monarchy to assert their rights over French territory. The Plantagenet kings would have been bemused by the idea of the English Channel representing anything more than a natural obstacle that separated two parts of a single polity. The national identities to which Farage, Johnson and Nicola Sturgeon all appeal are, in other words, relatively recent inventions. The point of this little essay is to remind ourselves that national identities are far more fluid than the diatribes of our populist politicians are prepared to admit. And this national identity will continue to evolve in the future. Nationalism led Europe to some very dark places in the twentieth century and the impetus for the original European experiment was a desire to learn from lessons of the past in order that they should never be repeated. I do believe that, whatever we think about the bureaucratic Juggernaut that the European Commission has become, the result is a Europe which is slowly transcending historic boundaries. So what is this post doing in a blog that is supposed to be about natural history and ecology of freshwaters? If ecology is all about how organisms interact with their environment then we need to pull back the focus from the stream or lake to encompass the actions of humans under that broad heading of “environment”. And we cannot consider the direct actions of humans – their immediate impacts on our freshwaters – without also considering the cultural and political spheres which regulate those activities. The UK’s withdrawal from the EU might not seem to be of great relevance to the world of algae which preoccupies most of my posts. Yet again, by reshaping the laws and regulations that determine how we interact with our environment, our withdrawal is of enormous relevance to every body of fresh water in the land. Normal business will be resumed next time. 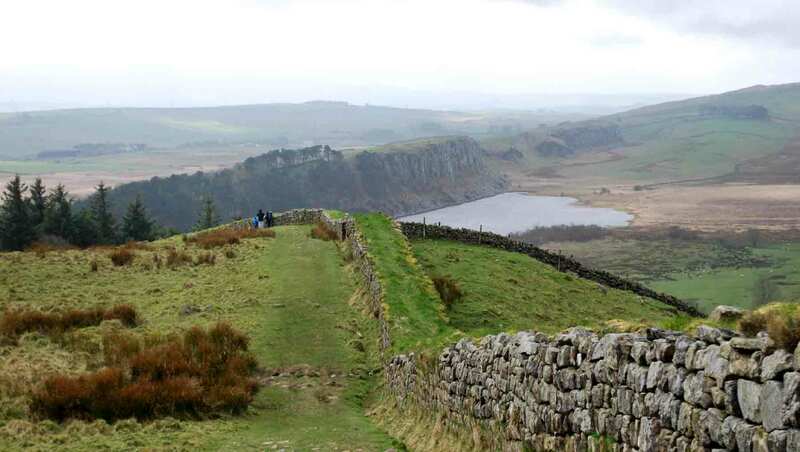 The photograph shows Crag Lough from Hadrian’s Wall, near Housesteads, photographed in April 2014. Back in June last year, when everyone was still reeling from the outcome of the vote to leave the EU, I wrote a post entitled “Who will watch the watchmen now?” In it I suggested that not only did the UK get strong environmental legislation from the EU, it also benefited from collective oversight that ensured that Member States actually enforce this legislation. This is exercised, ultimately, by the Court of Justice of the European Union, a body whose jurisdiction will cease once we leave the EU. That was what prompted the title of my post: good environmental legislation needs independent scrutiny. Where will that come from once we leave the EU? I was pleased to see this point being made forcefully in reports from the House of Commons Environmental Audit Committee and the House of Lords European Union Committee recently, as well as in a very useful report by Green Party MP Caroline Lucas. One recommendation of the Environmental Audit Committee is that the Government should introduce a new Environmental Protection Act to maintain and enforce environmental standards after we leave. One of the witnesses to the Committee made it clear that the terms of reference of the UK’s Supreme Court meant that we could not assume that it would fill the legal void left once the European Court of Justice no longer had authority. Even assuming that the Supreme Court could play a role, however, there would still need to be an organisation that scrutinised the activities of government agencies responsible for the environment and initiated the legal actions. I suggested in my earlier post that this body must be wholly independent of government. The Government’s aim, as stated in their white paper on Brexit, is that all EU legislation will be transposed into UK law in the first instance via the Great Repeal Bill, after which Parliament (and, where appropriate, the devolved assemblies) will be able to decide which elements of that law to keep, amend or repeal (clauses 1.1 – 1.3 in the Brexit white paper). However, Caroline Lucas points out that much of the new legislation is likely to be in the form of Statutory Instruments rather than Acts of Parliament, which will mean that there will be less scope for intense scrutiny by Parliament. If she is correct then this is an important – and worrying – loophole that those of could be exploited to water down future legislation. One point that Caroline Lucas makes (and which I touched upon in my earlier post) is that the European Commission grants a degree of flexibility in the implementation of legislation in the form of “derogations”. Does this mean that the UK governments will transpose into UK law the right to give themselves lower targets or extended deadlines? Again, who will hold the governments to account? DEFRA and their counterparts in the devolved administrations will continue to talk the talk, but the devil will lie in the detail and only the eagle-eyed are likely to notice when the sharp edges of current legislation are quietly eroded away. Another possible fate of transposed legislation, highlighted in the Environmental Audit Committee report, is that it will simply be ignored, again without the oversight of the European Commission and the European Court of Justice. The result will be “zombie legislation”, either not enforced or not updated to the latest scientific understanding. An unspoken question hovering behind much of this report is “is DEFRA up to the task?” The overall tone of the report suggests that the Committee is not yet convinced that it is. The question remains: who will watch the watchmen? I have worked with the UK’s environment agencies for 25 years now, and my travels around Europe convinced me that they were amongst the most effective at translating the fine words of EU environmental legislation into positive outcomes. Results in many cases are impressive (see “The state of things, part 1”). However, I have felt for a number of years that their effectiveness has been slipping. This started roughly when the coalition government introduced austerity measures after the 2010 general election, leading to substantially less money being available for the public sector. As the Environment Agency tightened its belt, it was noticeable that activities that were driven by EU legislation were less affected than most. The fear of the European Commission bringing infraction proceedings trumped almost all other factors when determining budgets (with the exception, perhaps, of flood protection). Chris Smith, Chairman of the Environment Agency adds in a recent blog that is well worth reading that this period also saw the Agency’s ability to speak publicly in defence of the environment being limited by the coalition government. The answer to this worrying situation is a body that can engage the government at the highest level in informed debate. This will almost certainly not be performed by yet another DEFRA-funded agency. But if not this, then what? I believe that the charity sector, professional bodies and environmental and wildlife charities may have to step in to fulfil this brief. Anglers already do this via the organisation Fish Legal (formerly the Anglers Co-operative Association); the time may have come for the rest of the environment and conservation sectors to learn from this well-organised lobby group. Perversely, if the “people” now have control of their own destiny (as the Brexiteers claim), then the government must be ready for those same people to ask the hard questions about their performance that we had previously delegated to Brussels.